For an unforgettable round of golf, it’s hard to beat teeing off with the Alps in the background. Snow-capped peaks, lakes and ancient forests create the ideal backdrop in which to explore the lush fairways, challenging undulations, and stylish clubhouses. With a little help from the pros, we’ve compiled a list of the top 10 golf courses in the French, Austrian, Swiss and Italian Alps. Set in the mountains of the Kitzbuehel Alps, this 18-hole Championship course was designed by Kyle Phillips—the man behind Kingsbarns Golf Links in Scotland. 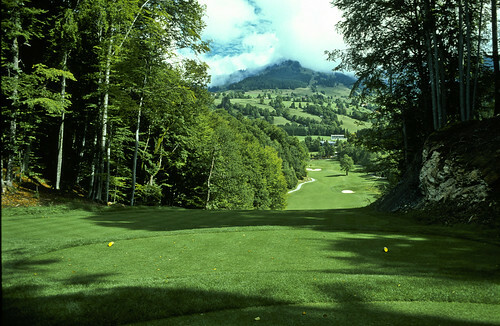 The Wilder Kaiser mountain range provides a breathtaking backdrop and the course itself is lined with oak trees (Eichenheim translates as ‘home of the oaks’). Pro golfer and Honorary President of the Austria PGA, Hans Lumpi, has been playing here for 10 years and believes it is well desereving of its place in the top 10. Kyle Phillips was fascinated by the game of golf ever since his early childhood. He graduated in landscape architecture an specialized in golf course design. After over ten years as architect and Vice President of the California-based Robert Trent Jones II practice, Kyle Phillips created his own Company. Phillips is at the forefront of the next generation of leading golf course architects world-wide. He has devoted much thought to how the game can develop in the years to come to enhance the enjoyment of golf connoisseurs on the five continents which are seeing his remarkable work. His first contract was at Kingsbarns, only ten kilometers from the “Home of Golf” in St Andrews. The resulting course was acclaimed universally and attained the top 50 course ranking in the world where it has remained ever since. Richard Wax: Why did you chose to become a golf-course architect? From 29th March to 1st April 2012, Verdura Golf & Spa Resort will host the prestigious Sicilian Open 2012. As part of the PGA European Tour, the resort’s championship links will welcome the defending champion Raphael Jacquelin along with 143 other professional players who will compete for the honour of becoming the Sicilian Open champion, winning both coveted Ryder Cup points and points towards the “Race to Dubai ” cash prize. The 45 holes at Verdura are made up of two 18-hole, links-style golf courses and one 9-hole par 3 golf course, all designed by leading golf architect Kyle Phillips, who has earned a reputation for developing design solutions that work in close harmony with the landscape. Sir Rocco Forte, a keen sportsman with a lifelong passion for golf, entrusted Phillips with the project of creating links-style golf courses in an area that is totally different from the Scottish coast in both temperature and landscape. Embracing the challenge with great enthusiasm, Phillips created superb links. Verdura Golf & Spa Resort will provide a unique golf experience for both players and spectators alike. The latter, whether resident or not resident guests will enjoy free unlimited access to watch the 4 day Golf tournament. The courses, featuring undulating fairways and deep bunkers, are set amid olive and orange groves, and despite both tracks being built to the same standard and occupying similar ground, the East and West courses provide different journeys and game experiences for golfers to enjoy. Challenging golf courses with outstanding views, pleasant temperatures and gentle sea breezes from the south -west Sicilian coast make the Verdura Golf & Spa Resort a unique location for the Sicilian Open 2012. A voting panel of experts ranked the two-year-old course 24th in the world, making it the best new golf course outside America. Designed by one of golf’s most innovative designers, Kyle Phillips, Yas Links is a testing par 72 that measures 7,414 yards off the back tees and boasts one of the game’s most spectacular finishing stretches, sitting opposite the Yas Marina Circuit F1 race track and in view of the iconic Ferrari World Abu Dhabi theme park. The combination of Yas and the emirate’s other two championship-ready courses – Abu Dhabi Golf Club and Saadiyat Beach Golf Club – create a distinct and differentiated golf experience. “Much like he did with Kingsbarns 10 years ago, Kyle Phillips has created a golf course from scratch that feels and plays like a completely natural site he just happened to stumble upon,” said Robbie Greenfield, editor of Golf Digest Middle East. With six clubs within a 90-minute drive, Abu Dhabi has a wealth of golf offerings – from parkland to beach and links courses – for all types of player.